Health care costs in America are over $3 trillion annually and increasing at well above the inflation rate. An annual Fidelity Investments study found that a 65-year-old couple can expect to spend $260,000 on unreimbursed healthcare over the course of retirement, a 6 percent increase over 2015. And prescription drugs are the main culprit. The study’s author’s point to continuing price hikes in specialty drugs, as well as fewer drugs coming off patent, as the chief causes of rising prescription prices. And those rising prices are taking a toll. In a recent Consumer Reports poll, a third of those who currently take a prescription drug said they experienced a spike in prices in the past 12 months — and that spike ranged from a few dollars to more than $100 per prescription. And according to a 2015 study from the Kaiser Family Foundation, 24 percent of patients reported not filling a prescription in the past year because of cost. These are sobering statistics. But there are few ways you can cut your prescription costs substantially. You can shave about one-third off of the cost of most prescriptions by paying with pre-tax dollars. The way to do this is to make a contribution to an FSA (Flexible Spending Account) or HSA (Health Savings Account). The primary difference between an FSA and an HSA is that contributions to the former have to be used the year they’re made (or within a few months after, depending on your employers’ deadline); if you don’t use the money within the time allotted, you lose it. So you only want to contribute the amount you believe you’ll need based on past health behavior. HSA dollars, on the other hand, are yours to keep. If you don’t have any health expenditures in one year, you can use them down the road. Whether a doctor is writing a prescription to lower your blood pressure or clear up your skin, ask two questions: Does my insurance cover this prescription? And is there a generic version that will be less expensive? To make sure insurance covers your prescriptions, it helps to be proactive. Once a year — a month or more before open enrollment — check if the prescriptions you take and procedures you’ll have coming up in the next year will be covered under your current policy. Generics are another powerful way to save. Name brands of anything are usually more expensive — it’s true at the supermarket and department stores, and it’s true at the pharmacy. And if there is no generic version of the medications you take regularly, keep in mind that one might be on its way. Watch for drugs coming off patent — after that happens, cheaper generic versions enter the market and prices tend to go down. You’d compare prices if you were buying a car, a computer, or even a jar of peanut butter. Why not prescription drugs? In part, there is a great lack of understanding that different pharmacies charge widely disparate prices for the very same prescriptions. To start, find out what your insurance company’s preferred pharmacy is charging for a particular prescription. Then start shopping around. You should consider joining Blink Health, a free membership organization that has negotiated lower prices on prescriptions for its thousands of members at pharmacies around the country, much as insurance companies negotiate on behalf of their members. You pay for your prescriptions through Blink then pick them up at your preferred pharmacy. Note: Even if you have insurance, it’s worth checking if the price you can get by using Blink on particular drugs is lower. There are other discount programs as well. GoodRx.com will show you the various prices you’ll pay for specific drugs at pharmacies near your location. And don’t neglect warehouse store pharmacies like Costco or Sam’s Club. (You don’t need to be a member — federal law prohibits pharmacies from having membership-only access.) “You’re looking at anywhere from 30 to 60 percent savings, depending on what the drug is,” says Andrea Woroch, consumer savings expert. Finally, understand that there may be valuable coupons available. Before visiting any pharmacy, do a quick online search for coupons with the name of the drug. Woroch says she was prescribed a prenatal vitamin with a copay of $60 a month, but after a quick coupon search, she ended up with a $20 copay. Also, sometimes it’s the case that the copay is more than the cost of the drug. If that’s true, don’t use insurance, and ask if the pharmacy offers a discount for paying in cash. 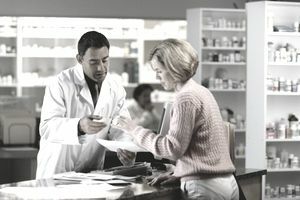 If you cannot afford to pay for your prescriptions, rather than splitting pills or going without, ask for help from the Partnership for Prescription Assistance (PPARX.com). You give this free service information about which medicines you take and about any insurance coverage you might have, and they can help with prescription assistance programs.